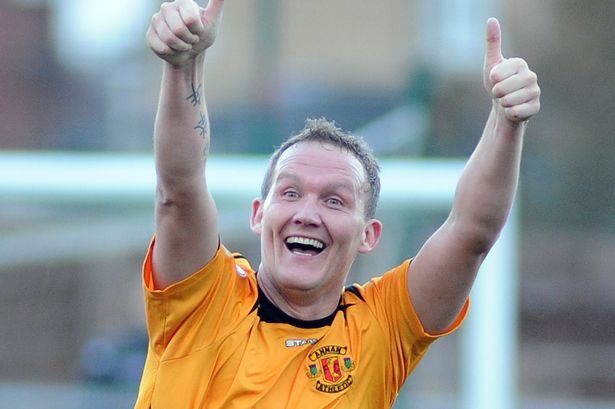 Annan Athletic broke their hoodoo away from home on a grass pitch after a hard fought and well deserved victory over promotion contenders Elgin City at Borough Briggs on Saturday. The victory looks to have come too late for Annan to grab one of the play off positions after East Fife’s important victory winning three nil against 10 men Berwick at Shielfield on Saturday. winning the game and still in with a mathematical chance of making the play offs. scorcher which left keeper Ross Laidlaw clutching at air. low shot across the keeper and into the corner of the net to make it 1-1.
which cannoned off the base of the post. also came close when his shot was saved by Ross Laidlaw. clinically from 6 yards with an instinctive shot which gave the Elgin keeper no chance. minutes later Hart had to save Mathew Cooper’s low shot. the feet of ace goal-scorer Peter Weatherson who poked the ball into the roof of the net from six yards. minute for the injured Steven Swinglehurst. remarkable game with his third goal, a superb strike from the edge of the box. ELGIN CITY :Ross Laidlaw, Mathew Cooper , Darryl McHardy, Ally Gilchrist, JamiE Duff, Mark Nicholson, Craig Thomson not u(Craig Gunn37 min), Brian Cameron, Jamie Reid ( Dennis Wyness 78min), Shane Sutherland, Archie McPhee ( Daniel Moore 74 min) SUBS NOT USED: Gordon Finlayson, Rory McEwan, Jared Kennedy, Stewart Black GK. ANNAN ATHLETIC: Jordan Hart, Steven Black, Steven Swinglehurst (Dan Wadge 78 min) , Martin McNiff, Peter Watson, Steven Sloan, Andrew Mitchell, Ryan McStay ( Rabine Omar 73 min), Peter Weatherson, Josh Todd, Junior Ogen. Subs not used Alex Mitchell, Jordan Brown, Connor Liddell. Referee- Gavin Ross. Assistants- Alistair Mather and Ronnie Strain.